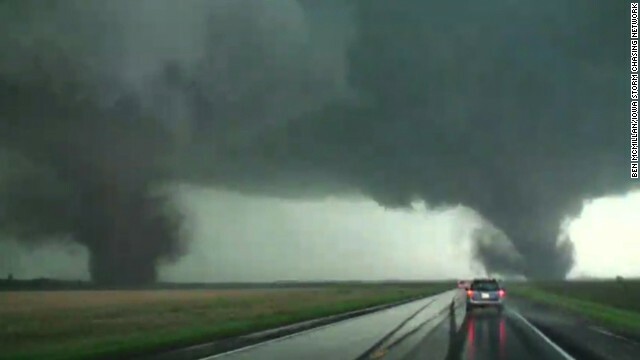 Twin tornadoes tear through northeastern Nebraska. The White House prepares as militants advance in Iraq. Tornadoes tear up northeastern Nebraska. And the U.S. notches a World Cup win over Ghana. Making preparations: As Islamic militants continue their murderous advance in Iraq, the Pentagon is moving more firepower and manpower into the region to prepare for whatever U.S. President Barack Obama has in mind. The aircraft carrier George HW Bush and five other warships are now in the Persian Gulf. More than 500 Marines and dozens of helicopters are on standby. Evacuating the U.S. Embassy would be a top priority if Baghdad starts to fall. Twin twisters: Two people are dead and 16 more critical injured in northeast Nebraska after a string of powerful tornadoes raked the area. The storm system spawned a pair of rare side-by-side twisters that roared across the countryside about a mile apart from each other. The town of Pilger was hardest hit, with up to three-quarters of the community of 350 people leveled. This should help ratings: The U.S. shook off old nemesis Ghana last night to win its opening World Cup match 2-1. The Americans scored early and late to hold off the team that knocked them out of the last two tournaments. The U.S. plays Portugal on Sunday and Germany next week. 20 years ago today: Where were you two decades ago tonight? Chances are you were propped up in front of a TV watching a slow-speed chase unfold on the freeways of Los Angeles. O.J. Simpson, riding in a white Bronco, casually evaded authorities for 60 miles before surrendering at his home. Police charged him in the deaths of his wife and a friend. For inquiring minds: Still don't know enough about the former first lady and former secretary of state? Then, this is for you. CNN Chief International Correspondent Christiane Amanpour hosts a CNN town hall meeting with Hillary Clinton at 5 p.m. ET tonight. Clinton is hocking her memoir "Hard Choices" on the way to a possible White House bid. There are sure to be questions about Benghazi and her legacy at the State Department. Who knows, maybe some details about Monica Lewinsky will pepper the conversation. –World Cup #fail: Delta did a major face-plant in congratulating the USA soccer team after its thrilling 2-1 win over Ghana. The airline used classic American and African symbols to tweet the score. Unfortunately, there are no giraffes in Ghana. You only had one job, Delta social media expert: Google image search "Ghana" RT @AdamSerwer: Dude really? https://t.co/FgOIhR5bNv"
- Sports hound: Buddy the Golden Retriever loves watching the World Cup. - Singing for the kids: Australian power couple Keith Urban and Nicole Kidman visit the children at a neonatal intensive care unit in their homeland. - Goat stampede: Watch out. They're cute, cuddly and ready to run. - Epic showdown: Dog vs. robot spider. The Dog vs Robot Spider clip had me in tears..sums up exactly how my boyfriend and I deal with spiders, he dances around it, I come investigate and run out of the room hahaha! So will the 500 Marines go ashore in Iraq barefoot so Obama's promise of "no boots on ground" not be broken? I noticed a big drop in school shootings over the week-end. What is the world coming to? Delta Airlines depicting a giraffe to represent Ghana!!!!!!!! OMG!!!!!!!! I know there are leopards,hyenas, chimpanzees, baboons, buffalos, lions,elephants, water buck, hartebeest, bush pigs just to name a few. Ok so I looked up the info. LOL!!!!!!!! It's ok Delta Airlines. It was the thought that counts.